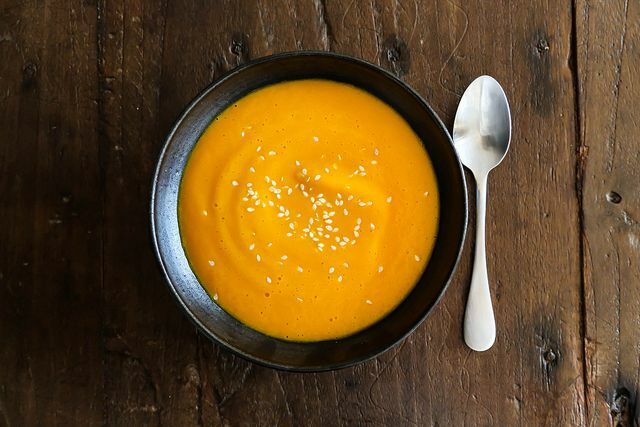 Today: Pull up a chair -- we're eating with Kristy Mucci all week. And when we're done, we'll have a new, 2-ingredient trick up our sleeves. 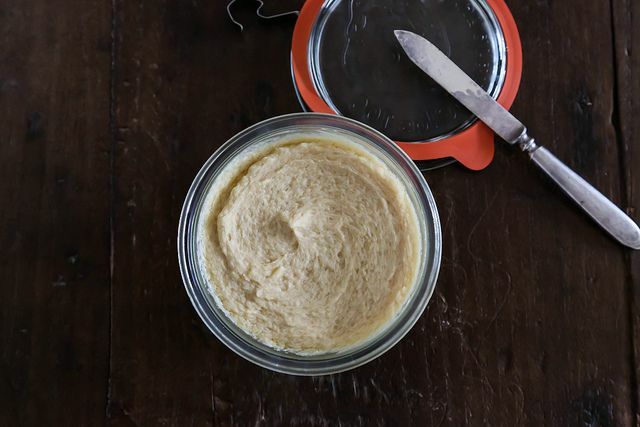 Miso butter might not be a new or groundbreaking idea, but it’s a delicious one. It’s versatile, easy to make, and a little goes a very long way. It’s earned a permanent place in my fridge, and regularly leads to fun kitchen experiments -- not one of which has been disappointing. I’m convinced it would be great in desserts, but I’m still too busy using it in savory dishes to bother trying. I made this batch by blending two sticks of butter with one cup of shiro miso. I liked the ratio, but you could use more miso, or less -- it's your call, and that's the fun of it. 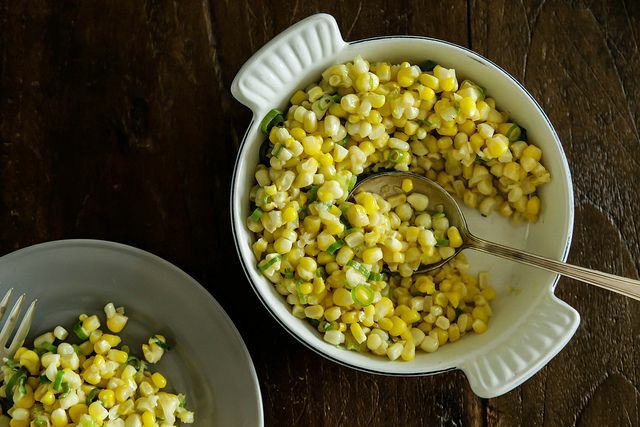 This is a bare-bones version of Momofuku’s Corn with Bacon and Miso Butter. I didn't have any bacon when I made this, but luckily corn and miso play very nicely together without it. Add it in if you feel like being decadent on a Monday night, or don't -- it will be delicious either way. By now everyone knows that tomatoes and butter are a winning combination. I was curious about adding miso to the mix, and was very pleased with the result. 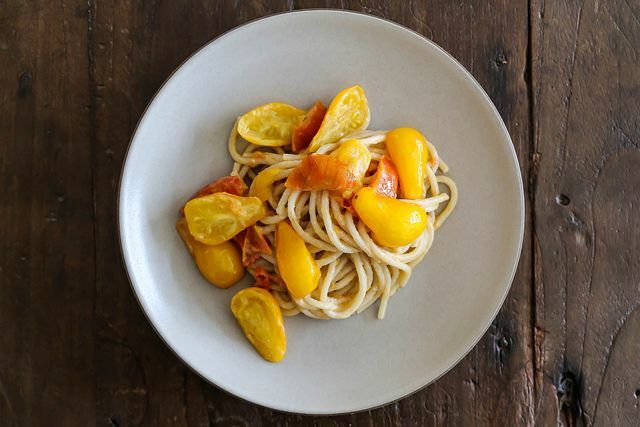 I chopped a large heirloom tomato and cooked it down with a few tablespoons of miso butter, threw in some halved cherry tomatoes, added cooked pasta (with some of the salty, starchy cooking liquid), and seasoned it with salt and pepper. This is going to be the easiest dish of the week. Ready? 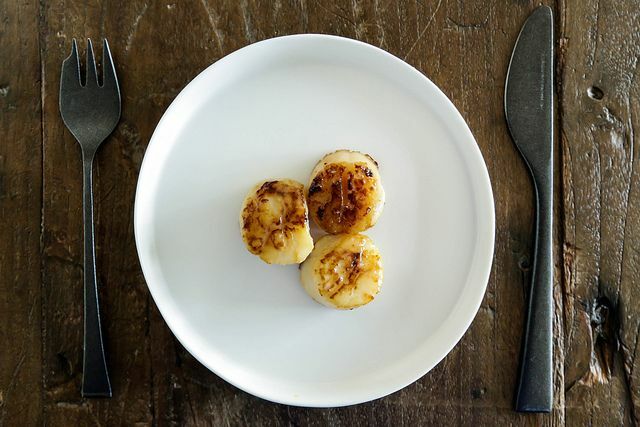 Sear some scallops, top with miso butter, and let it melt. That’s it. These were probably my favorite experiment. 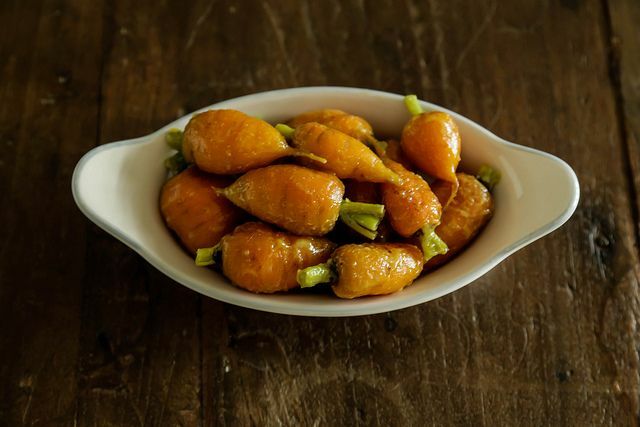 When carrots are this small and cute, I have to leave them whole, so glazed-ish carrots seemed like the way to go. I steamed these, and as soon as they were tender, I added miso butter and a pinch of curry powder. A friend suggested the curry, and I can’t thank him enough. I really like miso and carrots. I had leftover roasted carrots in the fridge, and I always have some kind of stock in the freezer, so soup (à la Reeve) was in order. I warmed up vegetable stock and carrots, added a scoop of miso butter, and buzzed it all in the blender. Sesame seeds seemed like a nice garnish; next time, I’ll toast them. 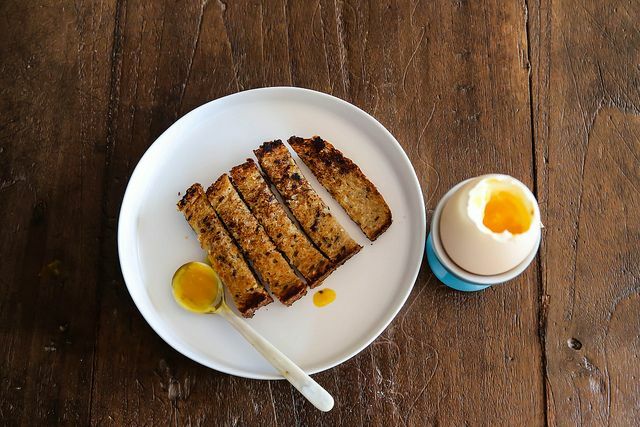 I’ll gladly eat a soft-cooked egg any time of day, especially if it comes with soldiers for dipping into the yolk. Miso soldiers, though, make an already good thing kind of perfect. A stick is 1/2 cup, 4oz, or about 113 grams. The question is now long the miso butter combo lasts, not the miso alone. :) 2 weeks sounds reasonable! You don't specify salted or unsalted butter. Normally I like things salty so I default to salted butter in most recipes such as the ones you listed. However, since the compound butter has a ton of salty Miso would you recommend switching to unsalted this time? The miso itself will keep forever! It's fermented soybean paste. t need to be cod, I used fresh caught fluke. What a great use of miso and a wonder main for any of these sides. I love this idea. Stopping by the Japanese market tonight for some shiro miso. Does anyone know how long will this keep in the fridge? I kept mine in the fridge for two weeks! It could probably keep longer, but since I didn't try it, I don't want to suggest it. Hope you like it! The butter and miso recipe is very tempting. You are right miso is very salty and a little goes a long way. After making Asian ginger dressing and traditional miso soup, I still have a pound of it left in the fridge. Thanks for the idea. though all these dishes sound delicious, none of them sound as though they would offer a person a complete "dinner". a bowl of corn? a plate of carrots? what would be suggested main courses for these items? These are first and foremost meant to be inspiration -- so start with the corn, or the carrots, and build from there! Maybe you could eat the corn with a fried egg on top to round out the meal, or the carrots next to some roast lamb. It's up to you -- but that's the fun! Anything you would add salt to, I guess. Miso is very salty. I just made the miso pasta for dinner. I have to say that dish was one of my favorite I've found on here. I will definitely be making it again. Is it bad that I want all of this for dinner tonight? This butter may have just changed my life.